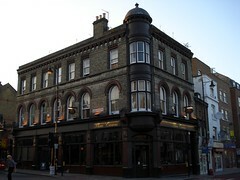 Pub on the corner of Stoke Newington High Street and Stoke Newington Church Street. It seems to be aiming towards the gastropub/upmarket end of the scale; there's even a laid-tables dining section at the front which carries an auto-added 12.5% service charge. As of early-2012, it's been taken over by 586 Ltd, who run The Lock Tavern in Chalk Farm, and the basement venue has been refitted as The Waiting Room. The comments below predate the change of management. We visited around 7pm on a Friday evening in September 2007; it was busy, but not so busy that we couldn't find a table. Rather too loud and too dark for Kake's taste (being a single enormous room), but some people like that sort of thing. There was real ale, though, to make up for it; Cornish Knocker in our case (chosen entirely for the novelty of the name, but it was quite an acceptable pint). Harvey's Sussex Best Bitter was also on offer. Nice big squashy sofas towards the back, too. Food (photo of sample menu) is served in the dining area at noon-3pm and 6pm-10pm Monday to Friday; noon-4pm and 6pm-10pm Saturday; and noon-4pm and 6pm-9:30pm Sunday. A reduced menu (photo of sample menu) is served (at the same prices) in the bar area, noon-10pm Monday to Saturday and 6pm-9:30pm Sunday. Reservations can be made for the dining area. Last visited by Kake and more RGLers than it makes sense to namecheck here, 7 September 2007. Opening hours taken from Time Out website, April 2008. Last edited 2013-05-10 08:09:20 (version 9; diff). List all versions. Page last edited 2013-05-10 08:09:20 (version 9).